The story with Bev Perdue's poll numbers doesn't change much: her approval rating continues to be in the mid-30s and she continues to trail Pat McCrory in a head to head for reelection by a high single digit margin. 34% of voters this month say they're happy with the job Perdue's doing while 49% disapprove. The biggest obstacle to Perdue seeing a significant improvement in her numbers continues to be a lack of support for her from Democrats, only 55% of whom give her good marks to 25% who dissent. Usually you'd expect a Governor to be at 70% or higher with voters in their own party. Perdue's numbers with independents, at 31/57, have a lot of room for improvement as well. These are actually the best approval numbers Perdue has had during the month of July at any point during her time in office. In July of 2009 she had a 25% approval rating and in July of 2010 she was at 32%. She still has a lot of room for improvement but she's at least in a better place than she was earlier in her term. 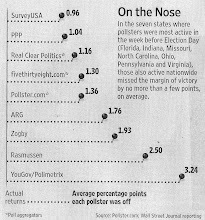 This month Perdue trails McCrory 47-39 in a hypothetical rematch of their 2008 contest. McCrory gets 83% of the Republican vote, while only 67% of Democrats will commit to voting for Perdue. And she trails by a 57/28 margin with independents as well. Certainly Perdue's unpopularity is the biggest reason she trails McCrory but he is also a pretty popular figure, with 29% of voters rating him favorably to 23% with a negative opinion of him. The 48% with no opinion indicates a lot of voters have already forgotten McCrory since his 2008 campaign so he will have a lot of reintroducing of himself to do once he formally enters the race. Over the last 3 months Perdue has settled into trailing McCrory by a 6-8 point margin. That's a significant improvement from the 11-14 point deficits she showed in polling between February and April. The legislative session definitely enhanced her stature and put her in a stronger position than she's been in a long time, the big question now is whether she can keep that improvement going once her foils in the General Assembly go home. One thing seems pretty certain: when McCrory finally does throw his hat in the ring he'll start out with the lead. Maybe also poll some more conservative alternatives? After 2010, not necessarily certain that McCrory would get the nod again. Where are the comments about how Perdue is going to tank Obama's chances in NC in 2012? I mean, you keep asserting that Rick Scott is going to help Obama in FL because his numbers are so low. If that's true (which I doubt) then why wouldn't the converse be true for the eventual Republican candidate in NC? Heath Shuler needs to run for governor. He would defeat Perdue in a heart beat. "Heath Shuler needs to run for governor. He would defeat Perdue in a heart beat." In a primary? Doubt it. He's not even loved by Dems in his own district, let alone statewide, particularly after voting against health care reform.